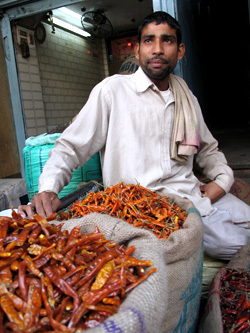 During my recent trip to India, my dear friend and fellow cook Natacha suggested we go to the spice market in New Delhi. As a professional cook, naturally I am intrigued by spices and herbs. Our last day in India, we rented a rickshaw, in search of exotic spices, armed only with our cameras, few rupees, and eager noses. 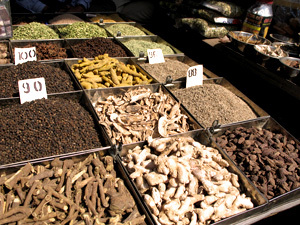 With a few well chosen words and some hand gestures, we explained to the driver that we wanted to see the real deal, not the spice shops for wimps but the spice market for the real men, so he drove us to the shipyard where they supply spices for the entire city. As we entered a maze of shrouded shops with no doors or windows, hidden in a dark inner courtyard, my nose became instantly aware of mounds of freshly ground spices. Hot powdered chili peppers, piles of black peppercorns, pungent clove filled lungs as my nose twitched and my eyes watered. We walked to the first niche, crowded with huge burlap sacks. I glanced around at the rough characters in charge, their tobacco-colored teeth, crusty lips and bloodshot eyes followed our every movements. As Natacha reached for her camera, I realized that we were the only women there. Undaunted by the unfriendly glares, Natacha and I began to ask the vendors – who spoke very little English – about their wares. As we went from stall to stall, purchasing bags of spices we had never seen, small smiles appeared on the dealers’ blistered faces. They began to pose for some of the pictures, next to their best merchandise. “So what do you do?” one of them who spoke better English said. “Well, we’re cooks…” I responded, pretending to stir an imaginary pot for the benefit of the others who were not as fluent. Turning to his co-workers, he explained the reason for our visit. The men smiled in unison, nodded, and one of them even rubbed his belly at the very thought. 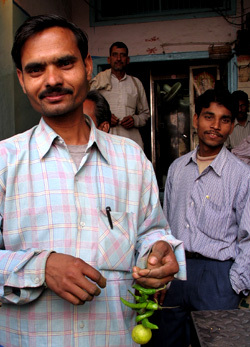 As we approached another stall, I watched a man string chilies on a black waxy thread with a fresh lime hanging at the end. When I asked him what its use was, he explained loudly in Hindi, the louder he spoke the better I would understand in his estimation! 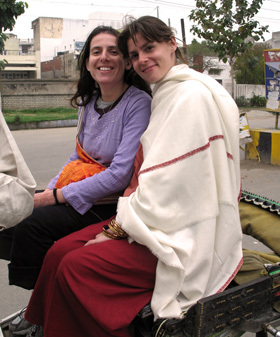 We headed back to the rickshaw, our bags bulging with spices, passing through the streets of New Delhi, passing small buses, other rickshaws and rickety horse-drawn carriages. Our driver pulled up alongside a bus full of young women decked out in gold and silk, who were no doubt headed to some festive party. As the driver flashed a toothless smile at Natacha, I saw the chili pepper/lime charm hanging from his rearview mirror. Could it be a charm to ward of evil, or perhaps the Indian version of the pine tree air freshener? Either way, Indians use spices in every aspect of their lives so the possibilities are endless. Once we returned to our group at Mrs. Bhandari’s guest house, I told our spiritual guide, Gurmukh, about the sites and powerful smells Natacha and I had encountered that day. “So Gurmukh…” I said, “out of all the spices, if you had to choose just one which one would it be?” Without hesitation, she responded, “Turmeric.” Wrinkling my nose, I thought, out of all the spices it’s the one I like least. “Well, it has amazing restorative qualities…” she continued. “It’s great for your respiratory system, joints, skin, you name it!” she said as I fingered the smooth, whole pieces of turmeric I had bought at the market. I suddenly remembered that I heard once that it even cures pimples! 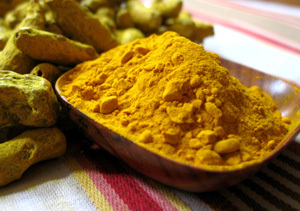 So I did a little research about turmeric, wanting to know more about its properties. Indeed, studies show that turmeric can prevent everything from childhood leukemia to Alzheimer’s Disease. Many people suggest taking a spoonful in your tea. Read the articles on www.webmd.com.